There’s been some confusion as to what the Women’s March on Washington is about. For some reason, some people have painted it as a march for reproductive rights, mainly abortion. And while reproductive rights are part of it, they aren’t the only part. Not by a long shot. Since last fall I have been part of/followed groups organizing this march. It took a while for them to find their way, but the process and discussion that brought us here was worth it. Here’s the link to the platform. The platform puts the march in support of the usual feminist suspects: the long-overdue Equal Rights Amendment, equal pay, paid family leave, and an end to violence against women. 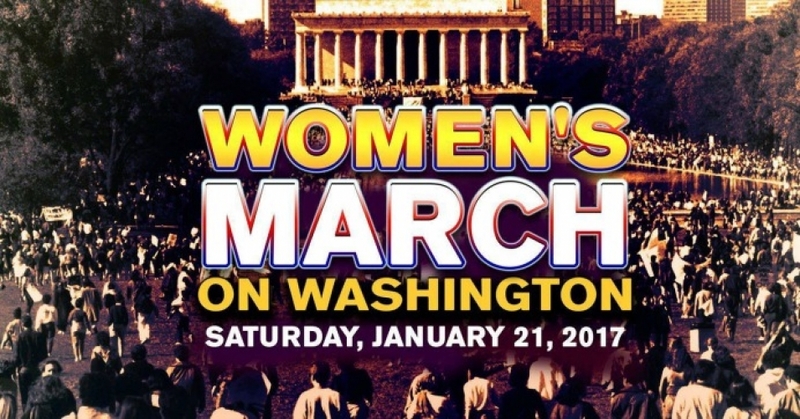 But it doesn’t shy away from issues that promise to rankle at least a few people who were planning on attending the Jan. 21 march. Organizers have laid out an unapologetically radical, progressive vision for justice in America, placing the march in the context of other past and ongoing movements for equality. “We welcome vibrant collaboration and honor the legacy of the movements before us—the suffragists and abolitionists, the Civil Rights Movement, the feminist movement, the American Indian Movement, Occupy Wall Street, Marriage Equality, Black Lives Matter, and more,” the statement starts out. Police Brutality: “We believe in accountability and justice for police brutality and ending racial profiling and targeting of communities of color.” as well as “We also call for an immediate end to arming police with the military grade weapons and military tactics that are wreaking havoc on communities of color.” It also addresses mass incarceration. That’s a biggie, since the Hyde Amendment affects poor women’s access to abortion. It affects their economy directly. This is an impressive platform, and while it is women centered (probably because it was women who organized to do something!) it isn’t just about women. It’s about a better world for everyone. This is feminism. The importance of this platform is not that it will garner immediate majority support–it won’t. The importance of this platform is in not allowing the alt-reich and the social conservatives to determine the terms of public discourse. They definitely put all the cards on the table. One of the biggest deals for me is that they didn’t shy away from BLM (Black Lives Matter) like many other groups do. To me, that signifies that they aren’t afraid and have thrown out the old rule book. Good for them! I suspect that those who somehow thought that this was a march for abortion rights are the same people who don’t much listen to women’s voices in the first place. Like you, P, I’ve been following the organization of this march since the beginning and the overarching message always seemed to be one of standing for justice. That just because it seems that justice was not the project of those who voted for Trump, it was important for the women who were looking for history to be made to communicate that we won’t be taken for granted. This is an excellent effort for a platform, and provides a set of principles for the long term, I’m thinking.